I had to reblog this. So well said! 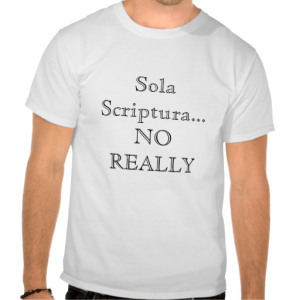 It is becoming apparent to me that no church, no theologian, no follower of Christ actually lives out their faith based on the idea of Sola Scriptura. Sola scriptura as a principal states that Scripture alone is authoritative for the faith and practice of the Christian. The Protestants among us recognize this and embrace it wholeheartedly. It sounds good on paper. It really does. Why do we need anything but the Scriptures to help us form the doctrinal positions that shape our faith? “WE DON’T” shout the reformers among us! The problem with their answer is it is demonstrably not true. I’ve never met anyone who actually practices this idea and neither have you. The New Testament church certainly did not. Thanks for re-blogging this! We have had almost 80 comments from Protestants, Catholics and Orthodox. The discussion has been very respectful, which I find refreshing and hard to believe! I couldn’t find anything to comment about. The post says what it says, and I don’t see how any of it can be denied.